Hello, and welcome to H2O - a J/C 'wet-fic' archive! I love J/C 'bath' stories and J/C 'get caught in a storm and soaked to the skin' stories, so I thought I'd open an archive, and invite people to submit their old 'wet-fic' tales or write new ones. Please note that due to time-constraints I won't be able to beta-edit submissions to the archive and that stories will be posted in the format they are received in :) *.txt format is fine, but if you need it, you'll find a basic story/html document template here. Just highlight and copy and paste it into a wordpad, rich text format, or notepad document, fill in the gaps, add your story then rate it (between G and NC-17), add a summary and a disclaimer, then send it to me and I'll post it here for you. Alternatively of course, if you already have it posted somewhere, just send me the URL and I'll link to it. SUMMARY: J/C. Moonlight, champagne, and an unexpected cold bath. I know there have been a lot of "codas to Coda" in Voyager fanfiction, but this is something I came up with in the wee small hours. SUMMARY: Takes place after the events of Counterpoint. Spoilers for Counterpoint obviously) and Sacred Ground. Inspired by the waterfall pix in Koffee Klub's summer 2002 PPP, but was never entered (in 2 parts, total 137KB). 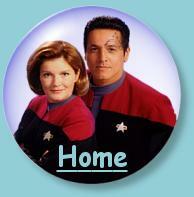 SUMMARY: After the kind of day he's had, all Chakotay wants is a nice dinner and a quiet evening at home. (84KB) - prequel to Ralkana's, "Kathryn and the Terrible, Horrible, No Good, Very Bad Day". SUMMARY: After the kind of day she's had, all Kathryn wants is a nice dinner and a quiet evening at home (88KB) - sequel to Maquis Leader's, "Chakotay And The Terrible, Horrible, No Good, Very Bad Day".